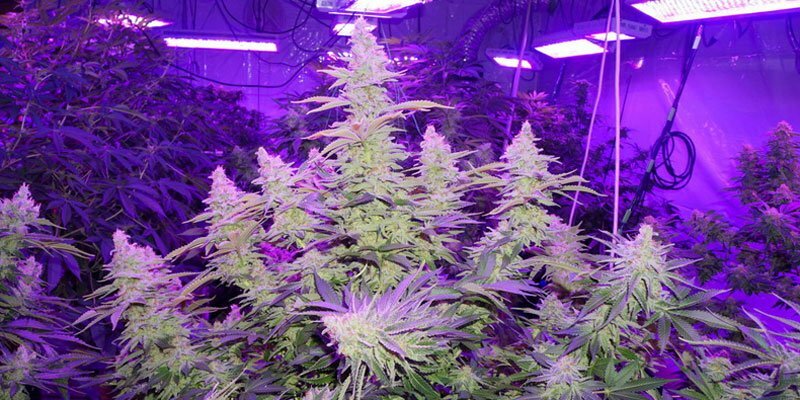 If you are planning on growing your Cannabis indoors, you most likely have already taken a look at the different lighting options available. Every grower has his or her personal preference for grow lights, and you have probably already received advice about setting up your own lighting system in one way or another. But how do you know that it is the best way for you? This article will provide you with the information you need to make an informed decision that will be best for you. It includes the various options for customization, as well as a few essential tips that are useful for every lighting system. One of the easiest to control and most important factors contributing to cannabis growth are the light cycles. As with all plants, cannabis relies on light as the foundation for the photosynthesis (wiki) process, the process by which the plant produces food and energy. Under natural circumstances, cannabis would follow the changing seasons in a particular environment. It would germinate, grow, flower, and go to seed all as reactions to changes in that environment. These changes include changes in light exposure, changes in temperature, and changes in relative humidity. The most important factor is almost always light, however, especially the cycles in which lighting occurs. The cycles of light and darkness are roughly equivalent to the relation of hours of night and hours of daylight in a day. Generally, cannabis plants get more light in a vegetative phase, and equal amounts of light and darkness during flowering cycles. Cannabis seeds are typically germinated during the spring when the hours of sunlight in a day begin to increase. They will continue to grow until the days get shorter and shorter. Eventually, as the shorter days warn of winter, the plants will begin the flowering process so that they can reproduce and pass on their genes. When the days are longest, the cannabis plant has the time and energy to develop a strong structure in preparation for heavy, sticky buds. At least, this is how the cycle would work in nature. Because of the wealth of growing techniques and artificial growing systems, sometimes these natural cycles can be modified and taken advantage of. In general, growers want the plants to be as healthy and strong as possible without expending any energy on seeds or reproduction. As alluded to above, growers can take advantage of the way plants develop in nature, essentially hacking the plants to perform in certain ways. One of these techniques is sometimes called ‘forcing.’ Forcing is the process of taking a plant that has been experiencing very long days (long exposure to light, between 18-24 hours) and suddenly switching the light exposure to only about 12 hours. By imitating the change from spring to summer, this technique has the effect of causing the cannabis plant to rapidly begin the flowering cycle. It’s this sort of high sensitivity to changes in light cycles and exposure that make it possible for growers to effectively grow cannabis. A pure Cannabis Sativa strain is not as sensitive to the light changes as some other varieties because it is originally from tropical regions of the globe. Generally speaking, the relationship between night and day is more stable in these tropical regions and changes relatively little between seasons. This is one of the reasons that Cannabis Sativa is larger than other varieties, taking up to 5 full months to reach maturity. Because it becomes so large before flowering, it is not as common for indoor gardeners to use a Pure Sativa strain. Hybrids can be grown without any problems. Feel free to experiment and do your own research into light cycles. Every cannabis strain will react slightly differently to different stimuli. The bottom line is that the light cycle is very important to the end product harvested. When cannabis plants receive the right amounts of light in the right cycles, the plant will thrive. A plant flowers when the ratio of light/dark is equal while they will stop flowering when the periods of darkness are interrupted by light. Regardless of whether you choose to grow your cannabis indoors or out, you are going to need a good source of light. More light means more weed. In nature, plants use the sun. Light is the force which makes photosynthesis possible, converting that energy into usable glucose and oxygen. Photosynthesis splits hydrogen from oxygen and then combines with oxygen and glucose. Glucose is the fuel of the plant, the chemical that powers the basic building and growing functions that carry Cannabis from seed to smoke. Your plants use a lot of light to produce it, and, in general, the more, the better. The important thing to remember is to keep the rest of the environment balanced with whatever amount of light you’re applying. You need to monitor the temperature, humidity, and levels of carbon dioxide in the air. Beyond that, your plant requires adequate nutrients and plenty of water. Your eventual goal as a grower is a high-quality yield of buds, and this will be determined in great part by the amount of light your plants receive. Cannabis is especially receptive to heavy lighting, and the quality and size of your flowers will be determined in part by all those lumens! In general, you want a minimum of 30,000 lm per 10 square feet in your grow room. With the proper balancing of the environment, you can go all the way up to 80,000 lm per 10 square feet. Don’t do this unless you are planning on devoting a lot of time, energy, and money into making sure that the environment is constantly getting the necessary tweaks. The flowers or buds of the Cannabis plant are comprised of the stalk, the leaf, and the calyx. If a plant receives light in abundance, then the plant will focus more on producing calyces than making flowers. The reverse holds true. If a plant isn’t getting enough light, then more energy will be devoted to the production of leaves, and you will end up with a worse harvest. This is because the plant is trying to compensate for the low amount of light by making extra leaves to pull in sunlight. The spectrum of light your plants are receiving affect growth a great deal. The sun has a very full spectrum, but you can control the types of light you are using in your grow room to achieve some excellent effects. Photosynthesis and a number of chlorophyll related reactions are stimulated by the orange, red and blue sections of the spectrum. Phototropism is controlled by colors ranging from blue to ultraviolet. This is the phenomenon by which a plant grows itself into the best possible position for capturing light. The most important general rule to remember about light and Cannabis cultivation is that red spectrum colors induce flowering, while blue spectrum colors promote growth. The cycles or periods of time during which your plant receives light is also important. While your plant is growing, it should be receiving about 18 hours of light for every 6 hours of darkness. When it’s time to flower, you’ll want to switch to 12 hours of light and 12 hours of darkness (hint: there are only 24 hours in a day). One of the really nice things about indoor growing is that you have full control over the light. You choose how the passage of night and day will occur, and so you should be mindful of providing it in ideal proportions so that your plant thrives. If you’re growing indoors, you’ll have to decide how best to set up your own lights. There are a lot of different options when it comes to the lighting system, and there are a lot of opinions, too. Lighting systems will vary in intensity, spectrum color, and the underlying technology. It will come down to the size of your grow room, your electrical needs, and how much time and money you’re willing to invest into lighting up your grow room. When you choose a light system, first plan on how much light you need to use, then compare that to how much light you can realistically provide for the plants. If you live in an old house with direct current, it probably won’t be much! Be realistic, and remember that lights use up a lot of power. When it comes to lighting, you have a lot of different choices. We covered some of the basics in types of lighting in the last section. In this section, we’ll cover more about the different choices you’ve been presented with, and discuss some of the pros and cons of the different lighting setups. Below we’ll offer a general look at some of the other lighting options you’re faced with as a Cannabis cultivator. Many growers argue about which lights are the best, but, in general, every type of light specializes in a certain phase of growth or a certain type of job. It’s up to the grower to decide how much time and money they want to invest into their lighting systems. 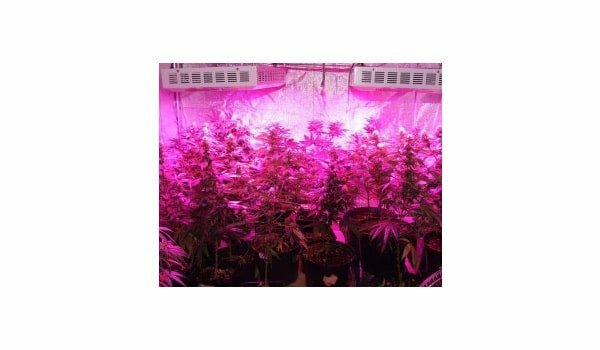 Nowadays, growers still use fluorescent lights when plants are extremely sensitive to heat. This applies to cuttings and seedlings in early stages of growth. Keep in mind, however, that the fluorescent lights still need to be close to the plants themselves, usually about 5 cm away. Fluorescent technology has changed somewhat, too, and now fluorescent lights offer slightly higher quality growing for Cannabis than they used to. If you’re using fluorescents, you’ll also want reflectors to go with them, to maximize their efficiency and save yourself some energy. High-intensity discharge grow light were first invented for a huge scale, for use in public arenas and stadiums. These sorts of light are very powerful, and they’re used by a lot of botanists and horticulturists to grow lots of things besides Cannabis. But they do work quite well for Cannabis, so let’s talk about them. Within the various types of HID light, we have mercury, metal halide, and sodium vapor light. We’ll cross mercury lights off the list right away because their lumen to watt capacity is too low for them to compete with the others. In the mid-80’s, when communication began in earnest about growing practices and how they differed in the US and Europe, growers and cultivators discovered a couple unusual differences. First of all, Americans were using a lot more power than their European counterparts. One of the reasons for this is because most Europeans were using horizontal reflectors and HPS grow lights, whereas Americans were using vertical reflectors and metal halide light. HPS lights have the ideal color range for Cannabis plants during their flowering phase while metal halide are superior for the growth phase. They function similarly to other HID lights and create light by arcing electric current through a bulb containing xenon and sodium gas. They emit a dull pink glow that quickly turns into an orange-pink light once it warms up. Again, these lights work spectacularly for indoor cultivation, especially for a plant going through the flowering phase of growth. You can purchase HPS lights in a number of different strengths: 250w, 400w, 600w, and 1000w. Don’t even think about using the 1000w light unless you’re growing a whole field in an underground bunker. In order to take advantage of the strength, you have to cool your grow room with an air conditioner. ‘Agro’ type lights are also a good choice. Made by Philips, the ‘Agro’ light slips into the blue spectrum, and the lights are easy on the pocketbook. You can expect to replace lights about once every year if you have them running a lot. LEDs (light emitting diodes) have become ubiquitous in the lighting world over the last decade. While not necessarily the ideal light for growing cannabis, LED lights offer several advantages. First of all, they are low voltage, which means less money spent on upkeep and electricity to keep them running. Coupled with this, they produce very little heat, which means you don’t need to worry about overheating your grow room if you use LED lights. It also further reduces your reliance on ventilation and fans, adding even deeper energy savings. In fact, depending on your operation, you may very well need to heat the room if you are using LED lighting. For growers prioritizing privacy, LED lights offer an additional bonus— the low heat makes LED lighting virtually impossible to detect with thermal imaging techniques commonly used to spot the infrared heat of more conventional HPS lights. LED lighting is also quieter than the other lighting options, without the background hum emitted by HPS lights. Remember that not all LED lights are created equal! Be sure to check your bulbs and make sure that they are high-wattage and have a high lumen value. The higher these are, the brighter your light will be. You also want to make sure that LED lights you choose have been specifically manufactured to emit light at the full spectrum of color your plants need for proper photosynthesis. LED lights do have a higher initial investment than some of the cheaper options, which can cause some growers to be skeptical about using them. Then again, they are very efficient. LED lights waste far less energy as heat, assuming the room doesn’t need to be heated, and those savings on electricity will pay for themselves in just a couple years. You also don’t need to worry about setting your grow room on fire, and LED lights last for a long time. Some manufacturers advertise more than 100,000 hours of life in their LED bulbs, which gives you enough time for almost ten years of harvesting. Click here for the best led lights for marijuana plants. The real key to deciding what sort of light you need is to figure out the size of your grow area. If you’re using an area that is smaller than 5 square feet, consider using a fluorescent or HPS 250w light. Fluorescent lights are small and they will help your cuttings root well. Later, as plants get large, you’ll want a HPS light. Ideally, if you’ve got the space, you should use a metal halide light when your plant is in its growth phase and a HPS light for the flowering phase. If you use a metal halide light for both growth and flowering, you’ll be ok, but your plant will have more foliage than necessary, and not as many flowers. This means you’ll have a lower yield. 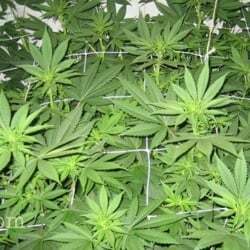 If you use a HPS light during the growth and flowering periods, you’ll end up with a plant that is long, but maybe not a structurally sound as you’d like. If you only have space or time to use a single light, consider using one of the ‘Agro’ types of light. Above all, be smart about using what you’ve got. It’s important to have lighting, but you need to plan it out, too. You can’t just fill a room with ultra-high wattage lights and expect your plants to thrive. Don’t waste valuable power, and learn how to make use of your resources. In this section, we’ll run through some basics on positioning your marijuana plants and lights, as well as covering some tips and techniques for avoiding stretching in your plants. This section will help you maximize the growth and bud efficiency of your plants, so pay attention. The leaves of the Cannabis plant uses light for photosynthesis, and the plant will orient itself towards the light it needs. Outdoor, it’s easy to see this phenomenon in other plants, and you’ll see it yourself in indoor growing operations. If you put the Cannabis plants too close together, they will prevent each other from getting light and less photosynthesis will take place. Obviously this will cause major issues for your plants. Make sure that every plant gets plenty of light. You also want a fairly uniform amount of light cast onto the plants themselves. It’s important that the buds on your plants all get the exact same amount of light, even if they are of different sizes. To do that, you need to make sure that each plant gets plenty of space. You don’t want any plants to hog all of the light and prevent its smaller relatives from growing. Giving your plants plenty of space from one another will also help air circulate, which is extremely important for maintaining stable levels of humidity. Let the plants touch each other only a little, or you risk buds malforming. This could encourage bacterial or fungal growth. If you aren’t growing a lot of huge plants, you can keep them together with small gaps. Trimming isn’t the best solution, but sometimes growers need to make do with limited space. Above all, your plant needs reliable and uninhibited access to light in order to thrive. Don’t let the plants crowd each other out! An easy mistake for many growers is placing their Cannabis plant too far or close to their lighting fixtures. Obviously if a plant is too far from a light, it won’t be getting the energy it needs to produce a healthy crop. These sorts of plants will grow up to be too thin and spindly, lacking the structural integrity to bear heavy yields. The opposite is true for lighting that is too close. It will be too hot, and plants can dry out and even die if they are badly burned by a powerful light source. Below we have a convenient list for growers to use in checking how far apart they want their plants and lights to be positioned from one another. Make sure temperature never exceed 80 degrees. Utilizing this technique also offers a grower the advantage of keeping smaller plants out of the shadows of the larger ones, an issue which would compound the lack of light. If your plants are of similar sizes, it’s not a bad idea to move them or the lights around periodically to help ensure that they are all getting equal shares of the bright stuff. You want every little bit of light to get to your Cannabis plants. The old saying “Waste not, want not” applies quite well to the cultivation of Cannabis. One of the first steps in preventing light loss for your growing operation is to reflectors in addition to your lights. This means you’ll want your lights positioned horizontally so that the reflection process is maximized. Vertically aligned reflectors inevitably lose more light than the horizontal ones. Also, try not to use any reflectors with single parabolas. Double parabola reflectors are far better at reflecting light. This goes for closed reflectors too. Closed reflectors function better because they direct light more efficiently into a tighter focus. That means you want horizontally installed double parabola closed reflectors in addition to the lights you choose. The two most common materials for reflectors are aluminum, both beaten and smooth. Each type of aluminum does a good job of reflecting light, but beaten aluminum will help diffuse the light. Some growers suggest that just painting the walls of a grow room white or using linoleum paneling is good enough reflectivity for your interiors. This is, of course, after the actual reflectors themselves, but your best bet is always going to be Mylar or Panda foil. Mylar is extremely reflective and does a great job of helping you maintain a stable environment for your plants. There’s a reason it’s used by growers all over the world. Just make sure you draw it tightly over the walls so there aren’t a lot of nooks and crannies in the surface to cause the light to dissipate. When you’re setting up a lot of different lights and reflectors, you should take extra care, especially if you are a new or amateur grower. After you’ve set up all the necessary lights and electrical equipment, you’ll be dealing with massively strong currents. If things aren’t set up properly and carefully monitored, you could experience power surges, outages, shocks, and fires. At high voltages, these can all be extremely serious issues, and very dangerous. Not only that, but if you’re using a hydroponics system like many indoor growers, you’re going to have a lot of water flowing around in that grow room. Water and electricity don’t mix well. Make sure everything is well grounded and safe in case of any sort of surge or spill. If you’re either a new grower and lack experience with electricity and wiring, leave these things to a professional. If you hire a professional make sure to check their background and make sure they know what they’re doing. Because of the inherent risk of spills and floods in a grow room, make sure that all of your electrical equipment is raised up off of the ground. Keeping it all above ground will help prevent any short circuiting if the room floods. Make sure your wiring and electrical systems are capable of dealing with the intense demands of a grow room before you get started too. We strongly advise professional help when it comes to electricity and wiring. Don’t burn your house down for some plants! By Stop Powdery Mildew On Marijuana Plants Now! Honestly, As a new grower; You probably should invest in digital switchable ballasts. 120-200 bucks for an entire (400-600 watt) system including MH and HPS lamps, hangers, and hood. Everything you need. You can but 2 or 3. Can you suggest a model/mfg for the beginner... Something online or Amazon? Have you looked in the Official buyers guide at the ILGM grow support forum. I have placed links to these products on Amazon, for you to choose from. Brock, I suggest an Ipower system. Ipower digital systems come complete with all you need. Available on Amazon. The seeds my Son bought me from here came up immediately. I am so impressed. I dont think you need a light schedule , it aready comes modified to flower on any light schedule,but 12-12is the ideal light schedule!! What is Distance between light and plant for LED Lights? Got a question ? Can you veg clones under double ended lite set at 625 watts. Can anyone help with a few seeds. what about flowering time ? doesn't have difference in the watt ? Second week in flower phase and my plants have grown up into my light which can not go up any higher in the tent. Should I top them off or tie them down? Does both the vent pipes for air in and exhaust need to vent outDoors ? Is it harmful to use spray milk water on flowering to keep mold at bay ?